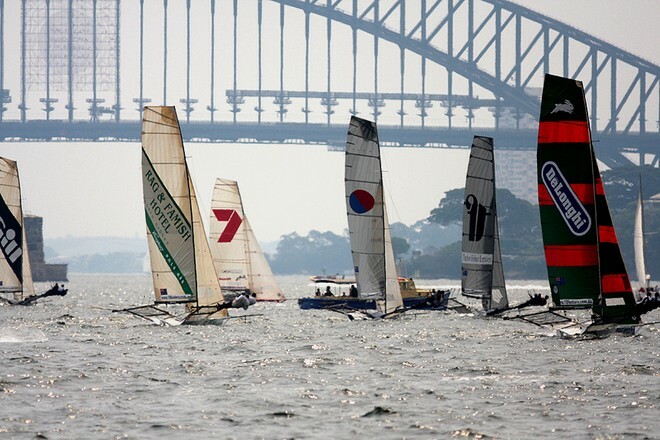 Michael Coxon, Aaron Links and Trent Barnabas have taken a tight grip on the NSW 18ft Skiff Championship after only three of the five scheduled races when they scored their third successive win in Thurlow Fisher-City on Sydney Harbour today. The trio, however, didn't have it all their own way as they had to recover from fourth place on the final lap of the course before going on to a 45s victory. 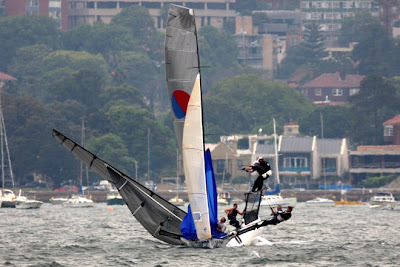 After leading for a majority of the race, Asko Appliances (Archie Massey, Dan Wilsdon and Cameron Mc Donald) had to be content with second placing, with a fast finishing appliancesonline.com.au, skippered by John Winning Jr., a further 1m6s back in third place. Gotta Love It 7 (Seve Jarvin) finished fourth followed By Gill (Dave Alexander) and Yandoo (John Winning). With just two more races left in the championship, Thurlow Fisher-City has a perfect score of 3 points to lead Gotta Love It 7 on 8 points, Asko Appliances 16, appliancesonline.com.au and Smeg (Nick Press) on 21 and Yandoo on 23. 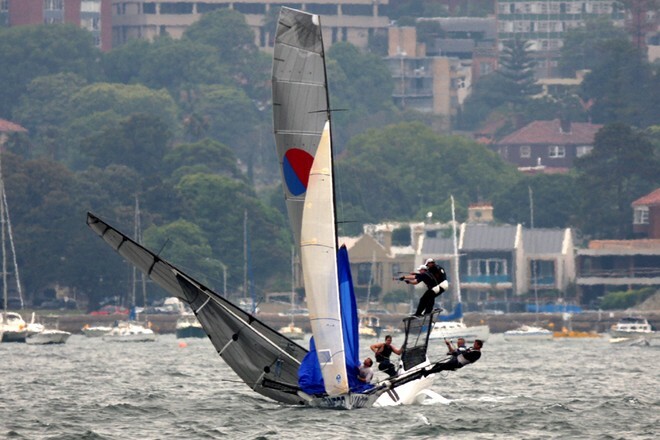 Today's race was sailed over a four-lap windward-return course in very fluctuating NW winds. Jacqui Bonnitcha, sailing as replacement skipper for Matthew Searle on Red Claw won the start near Clarke Island but Thurlow Fisher-City led narrowly from Gotta Love It 7 mid way up the windward leg with Kinder Caring Home Nursing (Brett Van Munster) in third place. At the windward mark in Athol Bay, Thurlow Fisher-City led Gotta Love It 7 by just three secs., followed by Kinder Caring, Asko Appliances, Thurlow Fisher-Bankstown (Bruce Savage), Gill, De'Longhi (Simon Nearn), Red Claw and Smeg, skippered by replacement Hugh Stodart. Thurlow Fisher-City retained her lead back to the twin bottom marks. The only change in the leading group was Asko moving into third place ahead of Kinder Caring. 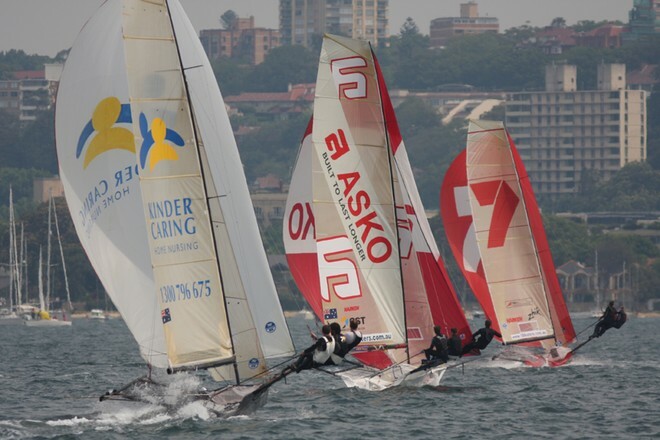 The LHS of the course was favoured on the second windward leg and the Asko team took full advantage to grab a 25s lead from Gotta Love It 7 and Thurlow Fisher-City. Another big improver was James Francis' Pure Blonde which wrked through the fleet to be in fourth place, just ahead of Gill and Kinder Caring. Asko Appliances increased her lead over the next lap of the course and held a margin of 1m25s at the windward mark the third time. Gotta Love It 7 was still in second place but Pure Blonde had continued her charge to be third, just ahead of Thurlow Fisher-City. Smeg was fifth ahead of Gill with a gap then to Yandoo, which had recoverd extremely well from a disastrous first lap. The race was turned on its head near the bottom mark when there was a combination of wind shifts and a large ship leaving the harbour. Asko was on the wrong end of these changes near Clarke Island which allowed Gotta Love It 7, Smeg (which was now third), Thurlow Fisher-City and Pure Blonde to reduce the leading margin. Coxon and his team were superb in the difficult conditions on the final windward leg and led narrowly from Asko Appliances and Gotta Love It 7 (only 3secs. separated the three teams) as they turned for home. 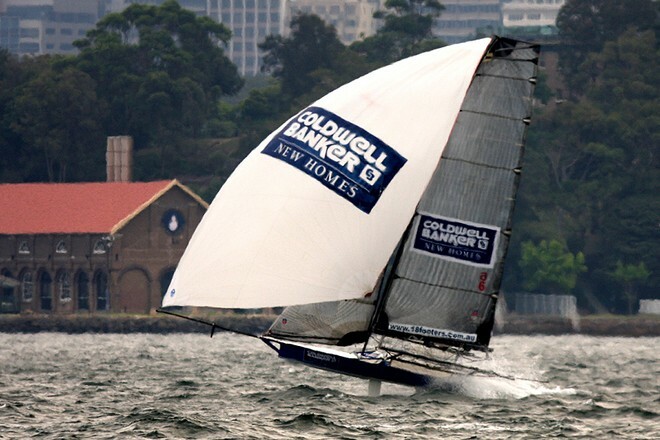 A brilliant spinnaker set saw Thurlow Fisher-City quickly open up a race-winning break on the run to the finish. 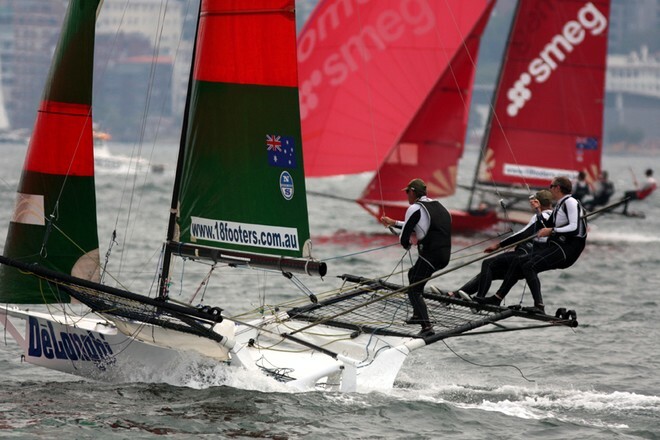 Race 4 will be sailed next Sunday with the last race of the championship scheduled for Sunday 6 December. More photos will be published on www.18footers.com.au and www.flying18s.com. Video will also be published on www.18footers.com.au.